Mr. Steven Patrick Byrnes, age 56, of Fort Mill, S.C., went to be with the Lord on April 21, 2015. Surviving are his wife of 22 years, Karen Byrnes; son Bryson, 12, a sixth grader at Charlotte Christian School; parents Jerry and Claire Byrnes of Charlotte; sister Betsy Byrnes of Charlotte; brother Dan Byrnes and wife Tammy of Charlotte; nephews Tyler, 21, and Dylan Byrnes, 17; and niece Samantha Byrnes, 13, of Charlotte. Steve was born April 14, 1959, in Chicago, and was raised in New Carrollton, Md. He attended Church of Christ at Gold Hill Road, was a 1981 graduate of the University of Maryland with a degree in Radio, Television and Film, and played football for one year at James Madison University before transferring to the University of Maryland. Steve enjoyed a successful and highly respected television broadcasting career for 30 years. He joined the FOX Sports family in 2001, hosting and reporting for multiple NASCAR programs and serving as a pit road reporter for NASCAR on FOX’s broadcast of NASCAR Sprint Cup Series races from 2001-2014. 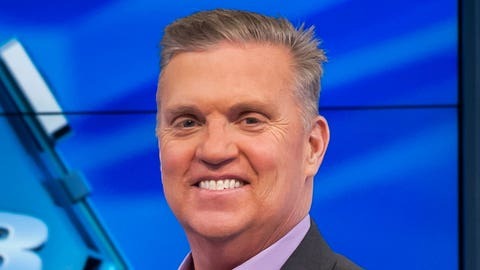 Most recently, he was the play-by-play announcer for FOX Sports 1 in the NASCAR Camping World Truck Series, and was co-host of NASCAR Race Hub for the network. Prior to joining FOX, Steve also hosted Darrell Waltrip‘s Racers on TNN, worked as a pit road reporter for CBS, WTBS and TNN, and hosted a variety of NASCAR programs for The History Channel and TNN, for which he moved to Charlotte in 1985 and remained in the area ever since. His first on-air job was at WCIV-TV in Charleston, S.C., in 1982, after commencing his television career as weekend sports producer at WJLA-TV in Washington, D.C., immediately following graduation from college. Steve also called play-by-play for a Carolina Panthers/Minnesota Vikings NFL game on FOX and NASCAR Sprint Cup Series races for DirecTV Hot Pass. Despite all his career accolades, Steve’s greatest accomplishment was his son, Bryson, who is growing into a more Godly, compassionate and respectable young man every day. Steve’s passion was spending every moment possible with Bryson, especially watching him play football and basketball and helping prepare him to play for the Charlotte Christian School football team as a seventh grader in the 2015-’16 school year. The other light of his life was Karen, with whom his relationship extended well beyond that of a spouse. The two were inseparable since meeting in 1988 while she was the public relations representative for Benny Parsons in his last season as a NASCAR driver. Attending Appalachian State University football games was one of the family’s favorite activities, in addition to cheering for the University of Maryland’s football and basketball teams; the Washington Redskins; the Carolina Panthers; following NASCAR; and watching nephews Tyler and Dylan play baseball. Steve also delighted in gardening, travel with his family, photographing sports, nature and sunsets. In addition to being a wonderful, loving and Godly husband, father, son and brother, Steve was an excellent friend, colleague and mentor to all who knew and loved him. His indelible impact extended even to the millions of television viewers who watched him every week over the years, as evidenced by the outpouring of public support he received following his cancer diagnosis in August 2013. Steve became a tangible example of strength, courage and fortitude to all who witnessed his battle with cancer and his personal crusade to spend as many days as possible with Karen and Bryson. He was honored to be designated as the keynote speaker at the American Cancer Society’s Relay for Life on June 7, 2014, in Charlotte, where he shared the inspiring story of his battle with hundreds of cancer survivors, caregivers and families during the Luminaria Ceremony that evening. A public figure who always made time for others and made strangers feel like longtime and valued friends, Steve took particular solace in his private life with his family. He was always smiling, supportive, selfless and loving. Upon his original diagnosis, Steve quickly found the positive in the situation and put his entire focus into his treatments, simultaneously vowing not to miss a single moment with his son. His motto and daily inspiration became "Be present" in every moment of his family’s lives. Now Steve is present with the Lord, and until we see him again, he is present in our hearts and memories forever. Steve, we give you back to the Lord with eternal love and great appreciation for His gift of you to us. We love you. The family will receive visitors Monday, April 27, from 6-8:30 p.m. at Calvary Church at 5801 Pineville-Matthews Road in Charlotte, N.C. A memorial service will be held at 1 p.m. on Tuesday, April 28 at Calvary Church with visitation immediately following. Palmetto Funeral Home in Fort Mill is assisting the family.